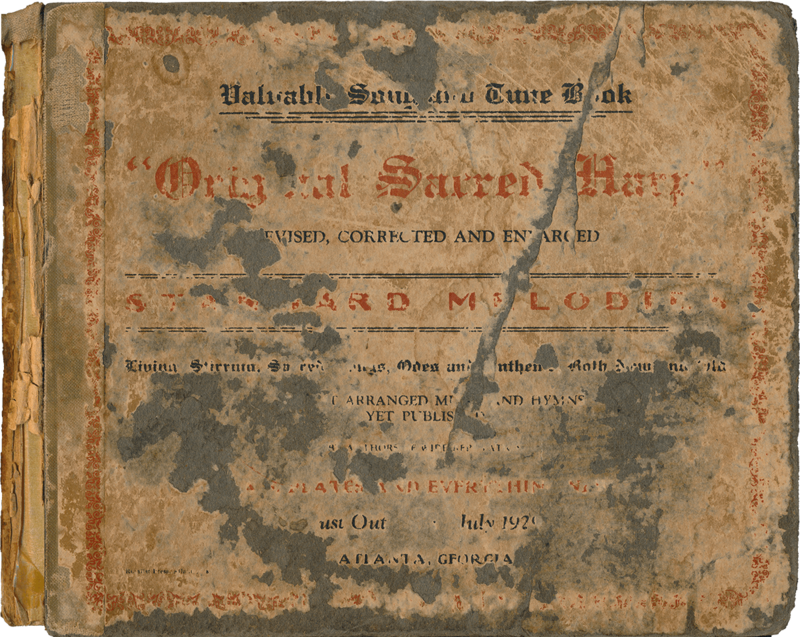 There were five early printings of Original Sacred Harp between the book’s initial publication in 1911 and 1929. (Two later printings date from 1949 and ca. 1964.) Each of these early printings features a similar cover. Of the differences among the books’ covers, the most prominent are the colors of the ink, paper boards, and cloth on the spine. In researching the publication history of this book while preparing a facsimile edition for publication in early 2015, I’ve run into trouble honing in on the colors of the third printing. 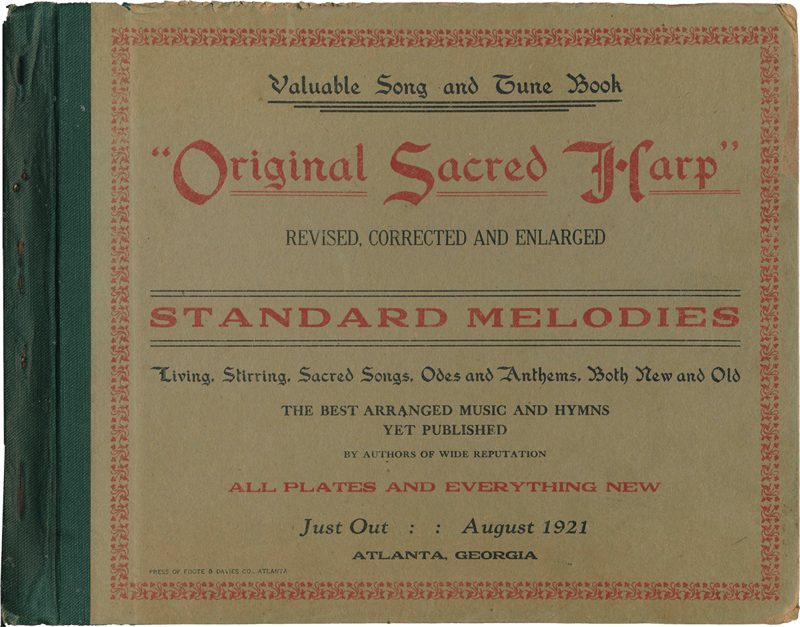 The Sacred Harp Museum owns copies of the first (1911), second (also dated 1911), fourth (1921), and fifth (1929) printings of Original Sacred Harp with relatively unblemished covers. Yet the museum’s two copies of the third printing (also dated 1911) are in much rougher shape. I’ve posted scans of covers of the first, second, third, and fourth, and fifth printings of the James book below. (I’ll be adding a scan of the cover of the fourth printing soon!) [Update, 9/2/14: Added! ; Update 2/17/15: new printing identified thanks to your responses, post altered accordingly.] Have you seen a copy of the third printing of the James book in better shape than the third image posted below? If so, please contact me! Front cover of J. S. James et al., eds., Original Sacred Harp (Atlanta, GA, 1911), [first printing]. 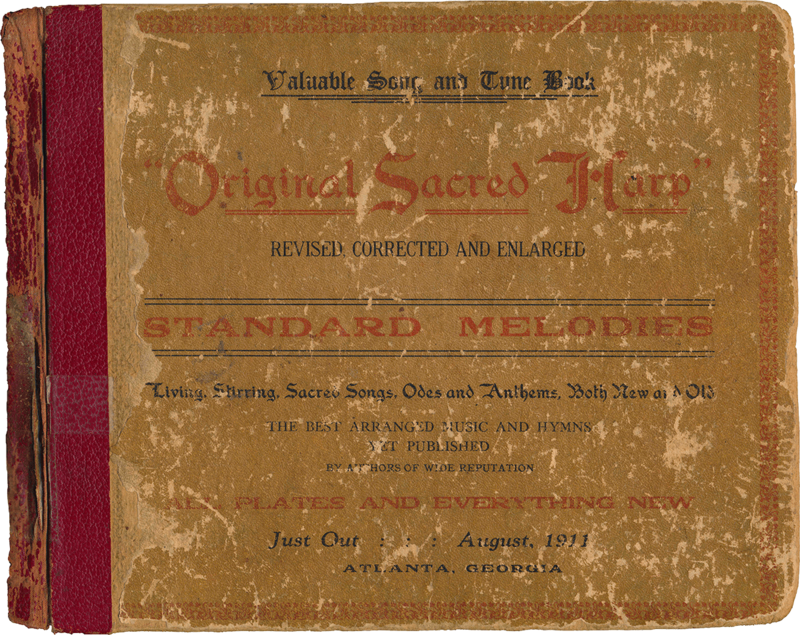 Front cover of J. S. James et al., eds., Original Sacred Harp (Atlanta, GA, 1911), [second printing]. 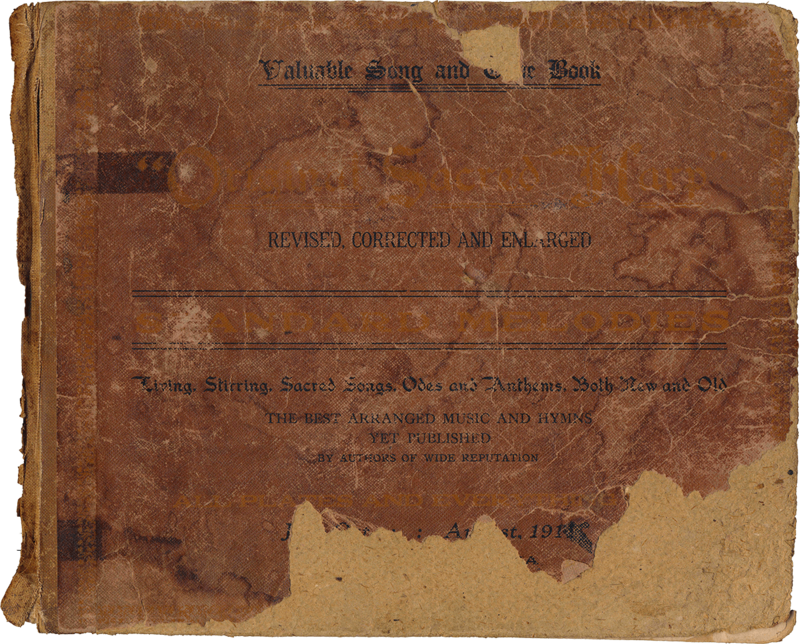 Front cover of J. S. James et al., eds., Original Sacred Harp (Atlanta, GA, 1911), [third printing]. 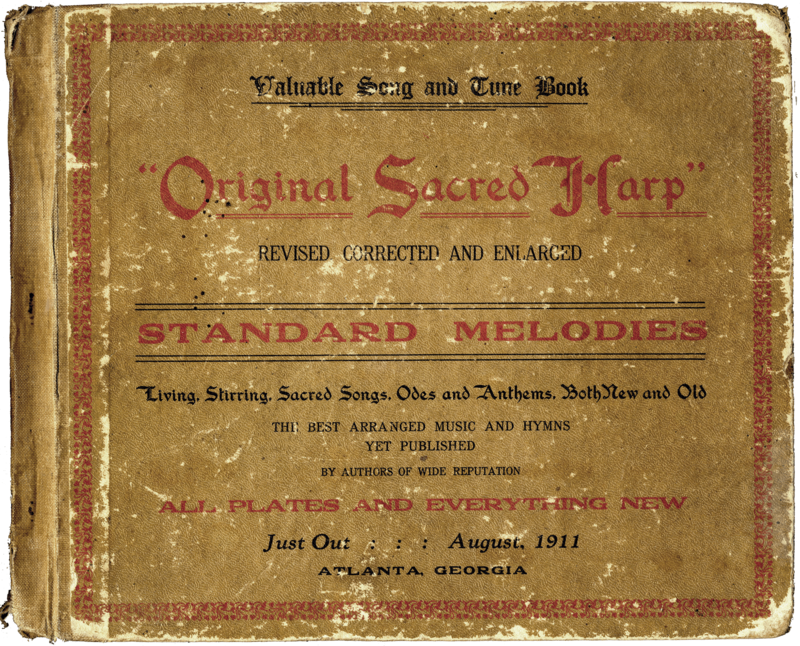 Front cover of J. S. James et al., eds., Original Sacred Harp (Atlanta, GA, 1921 ), [fourth printing]. Front cover of J. S. James et al., eds., Original Sacred Harp (Atlanta, GA, 1929), [fifth printing]. Thanks to Danielle Pitrone and Wade Kotter for scanning the front covers of these books. I may have a copy of it. I got it at Poplar Springs (near Bowden) at one of the Chatahoochee Conventions held there in the early 1970s. On the inside, it’s labeled Poplar Springs Book and is also signed by Loyd Redding. It does have the tan colored cloth on the end binding (unless it faded badly). Anything on the inside to indicate second printing? One quick way to differentiate between the first and second printings is to look on p. 82. Does the version of “Bound for Canaan” (the song on the top brace of the page) in your copy of Original Sacred Harp start with a quarter note pickup, or a half rest followed by a half note pickup? If the former, you have a copy of the first printing; if the latter, a second printing. Let me know what you find! Jesse: My 1911 copy has the tan cloth on the binding and also the half rest followed by a half note pickup at the beginning of “Bound for Canaan.” So, if I understand you correctly, I do have a second printing. Luckily the cover is in pretty good condition. I just sent you a scan. Wade and Dan: I’ve just checked a rather worn copy with a tan cover and tan cloth on the binding in the Sacred Harp Museum’s collection and it—like the copies you two have examined—has the musical change on p. 82t I’ve associated with the book’s second printing. This is a provocative finding as it indicates there were either two bindings for the second printing, or that what I’m calling the second printing is in fact two different printings. Perhaps there are internal differences among the brown and tan bound “second printings.” I’ll try to post a list of some additional changes between printings one and two soon so that we can figure out whether all or only some are present in this possible intermediate printing. Thanks so much for your help! Jesse: I look forward to seeing your list of additional changes between printings one and two. I did notice the difference in paper color between the image you posted and my copy; at first, I thought the color difference might be a result of discoloration from wear, storage conditions, etc. in the copy from the Museum, but on further examination of the photos, it does indeed look like they’re different. Fascinating!